The current paradigm for improving public health is to encourage people to perform moderate-to-vigorous physical activity. The current physical-activity recommendation is supported by decades of convincing scientific research. However, there is also emerging research highlighting the important and independent health benefits of reducing the amount of time people spend being sedentary, such as time spent sitting at desks and in front of a TV (Katzmarzyk, 2010). Indeed, emerging research suggests that life expectancy in the U.S. would be as much as two years longer if adults watched less television and sat for fewer hours per day (Katzmarzyk and Lee, 2012). What is sedentary behavior? Are sedentary behavior and physical inactivity two different health domains? This article answers these important questions, while also providing health and fitness professionals with frequency, intensity, time and type (F.I.T.T.) recommendations for reducing sedentary behavior. Sedentary behavior has been described as any behavior performed during the waking hours that elicits an energy expenditure less than 1.5 metabolic equivalents (<1.5 METs) while in either a sitting or reclining posture (Gibbs et al., 2015). Common forms of sedentary behavior include sitting for extended periods of time watching television or working on the computer while seated at a desk. Sedentary behavior also includes prolonged sitting while commuting or traveling in a car, bus, train or airplane. The sedentary behavior of an individual throughout the waking day consists of different domains: leisure time, household, occupation and transport. For instance, an individual living in a large city may spend several hours per day sitting in a car while commuting to and from work. In comparison, an individual in a small town may bike to and from work and spend virtually no time being sedentary throughout the work week in the “transport" domain of sedentary behavior. Different sedentary behavior domains exist. There is considerable variability among people in the amount of time spent being sedentary within each domain. Quantum improvements in technology have dramatically reduced the amount of movement required as part of daily life. In fact, daily occupation-related energy expenditure in the U.S. has declined more than 100 calories over the past 50 years (Church et al. 2011). Moreover, it has been shown that the contemporary U.S. adult is sedentary approximately 8.5 hours of the waking day, according to objectively monitored data from accelerometry (Healy et al., 2011). There is a significant-dose response relationship between daily sitting time and mortality from all causes and cardiovascular disease mortality in both men and women (Katzmarzyk et al., 2009). Population life expectancy in the U.S. would be two years higher if adults reduced sitting time to fewer than three hours each day and 1.38 years higher if they reduced television viewing to fewer than two hours each day (Katzmarzyk and Lee, 2012). The amount of TV viewed in Australia in 2008 was estimated to reduce life expectancy at birth by 1.8 years for men and 1.5 years for women. In comparison with individuals who watch no TV, people who watched TV a lifetime average of six hours each day were projected to live 4.8 years less. Furthermore, on average, every single hour of TV viewed after the age of 25 was estimated to reduce an individual’s life expectancy by approximately 20 minutes (Veerman, Healy and Cobiac, 2012). In a cohort of women from the Nurses’ Health Study, researchers found that the risk of obesity was two times higher and the risk of type 2 diabetes was 70 percent greater among those who watched more than 40 hours per week of TV, compared to those watching less than one hour per week (Hu et al., 2003). In a cohort of men from the Health Professionals Follow-Up Study, researchers found that the risk of developing type 2 diabetes was three times greater in people who watched more than 40 hours per week of TV relative to those who watched less than one hour per week (Hu et al., 2001). 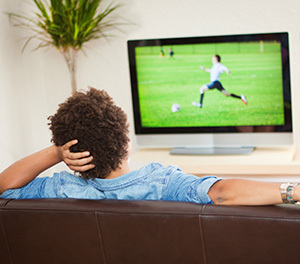 Overall, researchers have found significant associations between sedentary behaviors, including sitting and TV viewing, and various health outcomes such as obesity, type 2 diabetes, cardiovascular disease mortality and mortality from all causes. Given these collective findings it’s not altogether surprising that sitting has been dubbed the new smoking. Why Is Sedentary Behavior Unhealthy? The reason why sedentary behavior is unhealthy can be explained in large part by the molecule adenosine triphosphate (ATP), which is the energy currency of the cell that is required to support muscle contraction. Two of the primary fuels used to regenerate ATP in skeletal muscle cells are blood glucose (i.e., a carbohydrate) and blood triglycerides (i.e., a fat). Regular skeletal muscle contraction, either from purposeful exercise or other regular movements that are related to the routines of daily life (i.e., non-exercise activity thermogenesis or NEAT), creates a regular demand for blood glucose and blood triglycerides to be used for ATP resynthesis. Alternatively, when ATP demand is low, as would be expected with prolonged sitting, the skeletal muscle has little need for blood glucose and blood triglycerides. Under these low ATP-demand conditions, there is a concurrent downregulation in the molecules responsible for bringing blood glucose and blood triglycerides into skeletal muscle cells. In the case of blood glucose, the activity of GLUT-4 transporter protein decreases, which subsequently prevents uptake of blood glucose into the cell. Likewise, lipoprotein lipase activity, an enzyme that is responsible for breaking down triglycerides into free fatty acids and making these fuels available for uptake into skeletal muscle, is also decreased when there is low ATP demand. Collectively, these unfavorable metabolic adaptations lead to increased blood concentrations of blood glucose and blood triglycerides, both of which are well-established risk factors for type 2 diabetes and cardiovascular disease. Moreover, it is also well known that if there is a low ATP demand, this in turn equates to decreased energy expenditure. If this decreased energy expenditure scenario is not offset with a reduced energy intake, the net result is obesity. Taken together, it becomes clear that the negative effects of being sedentary can be attributed to a low ATP demand. The good news is that these metabolic abnormalities are frequently reversible by simply increasing levels of physical activity and eliminating excessive sedentary behavior. Sedentary behavior refers to too much sitting, while physical inactivity signifies too little exercise. For example, an individual can be considered active according to the current physical-activity guidelines; however, he or she may still spend too much time sitting in front of the TV (Owen et al., 2011). This is known as the active-couch potato phenomenon. This term might describe, for example, an officer worker who participates in group exercise classes for 45 minutes every lunch break throughout the work week, but who spends the remainder of the day seated at his or her desk. The research community is increasingly interested in whether or not individuals who fall within the active-coach potato category are at increased risk for health problems (Katzmarzyk and Lee, 2012). Indeed, it was recently reported that total sedentary time was consistently associated with various unfavorable cardiometabolic biomarkers (e.g., insulin resistance and elevated blood triglycerides) even after adjusting for physical-activity time (Brocklebank et al., 2015). The fact that sedentary behavior and physical inactivity are two distinct health domains has important ramifications for health and fitness professionals. If clients are to achieve optimal health it means that health and fitness professionals should be providing guidance on reducing sedentary time. Next we turn our attention to designing and implementing a successful program aimed at reduction of sedentary time for our clients! A FITT for Reducing Sedentary Time? The F.I.T.T. formula—which consists of frequency, intensity, time (duration) and type of exercise—is commonly used to design exercise training programs. The same approach can be applied to designing a program for reducing sedentary time. Table 1 outlines F.I.T.T. 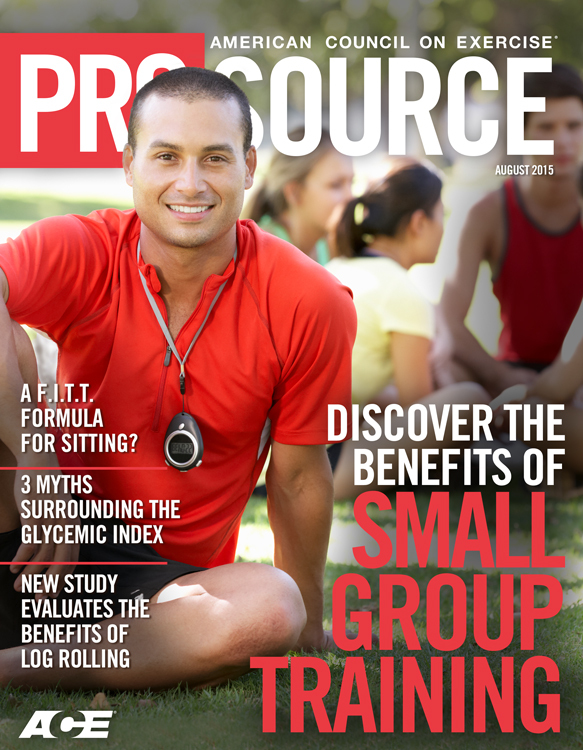 recommendations for helping clients reduce their sedentary behaviors. Frequency: This component refers to the frequency of breaks from sitting. It has been found that more frequent breaks in sedentary time are associated with more favorable metabolic attributes (Healy et al., 2008). Accordingly, it has been recommended that the frequency of breaks from sitting should be at a minimum every 30 minutes to 1 hour (Owen et al., 2011). Intensity: This component refers to the intensity of the sedentary break activity. Intensity can be quantified using various methods, including a percentage of maximal oxygen uptake (VO2max) or METs. Light-intensity range activities are recommended for the sedentary break activity: <25 to 50% VO2max or >1.5 to <3.0 METs (Hamilton et al., 2008). Time: This component refers to both the overall daily amount of sedentary time and length (time) of each sedentary break bout. Given that it has been found that objectively measured total sedentary time (i.e., absence of whole-body movement) is linked with obesity, abnormal glucose metabolism and the metabolic syndrome (Healy et al., 2008), it has been recommended to limit discretionary sitting time to no more than 2 hours per day (Owen et al., 2011). It has also been reported that breaks in sedentary time an average duration of approximately 5 minutes were beneficially associated with decreased metabolic risk (Healy et al., 2008). Type: This component refers to the type of activity performed when interrupting sedentary time. Light-intensity activities are recommended. Examples of light-intensity activities include routine household tasks, such as washing dishes or folding laundry. It is also recommended that light-activities be substituted whenever possible for sedentary time. For instance, persons could stand while talking on the telephone or rather than send an email, actually walk to the other person’s office and talk directly to the individual. To facilitate ease of substituting light-intensity activities for sedentary time, a number of modifications to the household or occupational environment can be performed, including removal of chairs from the TV area, positioning computers at a standing height (see Figure 1) and placement of a counter in order for some meals to be consumed while standing (Owen et al., 2011). Now that we have familiarized ourselves with the integral components of a F.I.T.T. program to reduce sitting time, let’s turn our attention to several key considerations for sharing this vital information with clients. Establish realistic expectations for clients: It is important to acknowledge that even with a highly committed client the technological reality of the modern-day world will make it extraordinarily challenging to completely eliminate all sedentary behaviour. This realization ensures appropriate expectations are established for exercise professionals and clients alike. Identify the specific domains where sedentary behavior is a problem: When discussing with your client how to reduce sedentary time, it is important to identify the actual domain where sedentary time is problematic. For instance, one client may have a teaching job at which he or she spends long hours sitting at a desk throughout the work week. 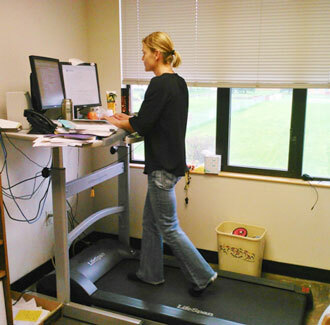 In this instance, making the recommendation to switch to a walking treadmill desk makes sense. However, for another client for whom sedentary behavior is not concerning in the occupational domain, it would not be prudent to make the same recommendation. In contrast, for the second client, he or she may report getting home at night and spending several hours each evening either on the computer or watching TV. The household domain is the challenging area for this individual with respect to sedentary behavior. 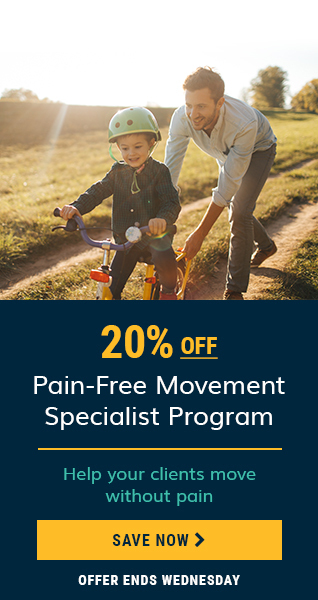 In summary, it’s important to match the recommendations for limiting sedentary time to the specific troublesome areas for each individual client. Reducing sedentary time requires behavior modification: In much the same way we need to understand the various factors that predict lack of exercise, we need to appreciate the various factors that are predictive of a sedentary lifestyle. This realization is paramount to formulating appropriate strategies for successful sedentary behavior modification. It has been suggested that several of the same behavior-modification strategies employed for increasing physical activity could also be applied toward attenuating sedentary time. For example, the self-efficacy construct from the Social Cognitive Theory suggests that the use of self-monitoring and establishing realistic and measureable goals could be a viable approach to ensure initial success with reducing sedentary time (Owen et al., 2011). 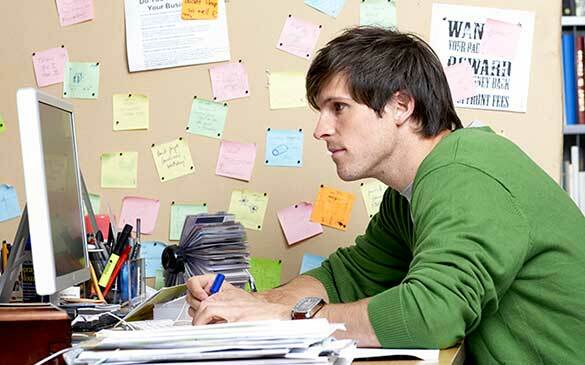 In particular, a daily sitting-time log could be used as a method of self-monitoring. Finally, realistic and measurable goals might entail limiting screen time to fewer than two hours each day or standing up and walking around the living room during each TV commercial break. Brocklebank, L.A. et al. (2015). Accelerometer-measured sedentary time and cardiometabolic biomarkers: A systematic review. Preventive Medicine, 76, 92-102. Church, T.S. et al. (2011). Trends over 5 decades in U.S. occupation-related physical activity and their associations with obesity. PLoS One, 6, 5, e19657. Gibbs, B.B. et al. (2015). Definition, measurement, and health risks associated with sedentary behavior. Medicine & Science in Sports & Exercise, 47, 1295-1300. Hamilton, M.T. et al. (2008). Too little exercise and too much sitting: Inactivity physiology and the need for new recommendations on sedentary behavior. Current Cardiovascular Risk Report, 2, 292-298. Healy, G.N. et al. (2011). Sedentary time and cardio-metabolic biomarkers in US adults: NHANES 2003-06. European Heart Journal, 32, 590-597. Healy, G.N. et al. (2008). Breaks in sedentary time: Beneficial associations with metabolic risk. Diabetes Care, 31, 661-666. Hu, F.B. et al. (2003). Television watching and other sedentary behaviors in relation to risk of obesity and type 2 diabetes mellitus in women. Journal of the American Medical Association, 289, 1785-1791. Hu, F.B. et al. (2001). Physical activity and television watching in relation to risk for type 2 diabetes mellitus in men. Archives of Internal Medicine, 161, 1542-1548. Katzmarzyk, P.T. and Lee, I.M. (2012). Sedentary behaviour and life expectancy in the USA: A cause-deleted life table analysis. British Medical Journal Open, 2, e000828. Katzmarzyk, P.T. (2010). Physical activity, sedentary behavior and health: Paradigm paralysis or paradigm shift? Diabetes, 59, 2717-2725. Katzmarzyk, P.T. et al. (2009). Sitting time and mortality from all causes, cardiovascular disease, and cancer. Medicine & Science in Sports & Exercise, 41, 998-1005. Morris, J.N. et al. (1953). Coronary heart disease and physical activity of work. Lancet, 265, 1053-1057. Owen, N. et al. (2011). Adults' sedentary behavior determinants and interventions. American Journal of Preventive Medicine, 41, 189-196. Veerman, J.L. et al. (2012). Television viewing time and reduced life expectancy: A life table analysis. British Journal of Sports Medicine, 46, 927-930. 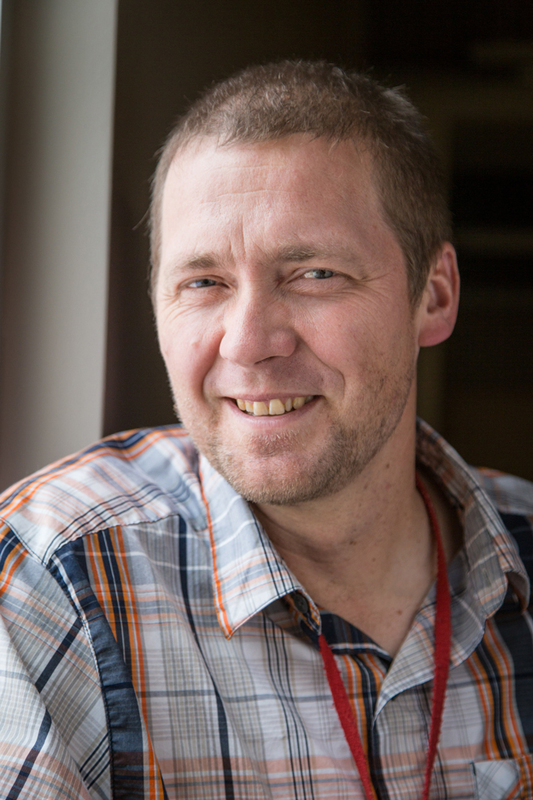 Lance C. Dalleck, PhD, is an associate professor of Exercise and Sport Science at Western State Colorado University. His research interests include improving exercise performance and health outcomes through evidence-based practice, quantifying the energy expenditure of outdoor and non-traditional types of physical activity, and studying historical perspectives in health, fitness and exercise physiology. Dr. Dalleck is a member of the ACE Scientific Advisory Panel. Emerging research suggests that life expectancy in the U.S. would be as much as _____________ longer if adults watched less television and sat for fewer hours per day. Which of the following is NOT considered one of the domains that comprise sedentary behavior? Sedentary behavior refers to ____________________, while physical inactivity signifies _____________________________. Which of the following is NOT one of the components of the FITT model for exercise programming?